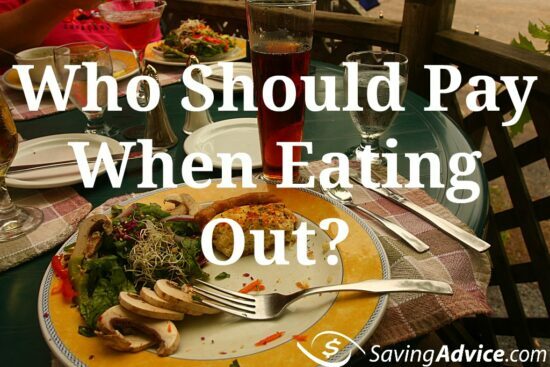 Who Should Pay When Eating Out? I just enjoyed a delightful lunch with an old friend. I drove to her office and we walked to a nearby seafood restaurant where we were able to relax and catch up. It was quite a pleasure and I had a completely and thoroughly entertaining meal with her. After we had finished our lunch, the server brought the bill over to our booth and presented it directly and undeniably to me. The server let there be no doubt as to who she expected to pay and it was clearly the male in attendance. On the one hand, I did not mind receiving the bill because I had fully intended to buy lunch since my friend had paid the last time we got together (and I don’t forget these things). On the other hand, I really felt that the server’s implied sexism was a bit out of date. After my friend and I negotiated for a moment over who would pay — my friend arguing that the employed person should pay and me arguing that the person with custody of the tab should pay — I paid the bill (since possession always wins), and we strolled back to my friend’s office. As I drove home, I recalled a few amusing anecdotes that my friend had shared but my thoughts kept drifting back to the restaurant bill. As a person who is supposed to be thinking about ways to save money, was I foolish to turn down my friend’s offer to pay? No — I did the right thing, but there are plenty of scenarios in which I would have allowed a friend to buy me lunch. If you have never thought through your strategy of “who pays?” here is how I break down payment obligations when two or more people dine out. This is an easy scenario. Each party should pay his or her own way unless one party expresses otherwise. A service provider trying to court a potential client should certainly offer to pay and can probably justify the cost as a client development expense. A client who wants to reward a service provider for a job well done might also offer to buy lunch (or dinner) as a reward for a job well done. The assumption going into any business meal, however, should be that both parties pay their own way. This is another easy one. Whoever asks another person to dine out as part of an established or desired romance should also bear the cost of paying. Personally, I understand that philosophy but I have never lived by it. I am perhaps a bit old-fashioned (and some would say sexist) in that regard but any time I went out on a date, I always insisted on paying. Fortunately, it has been twenty years since I was in the dating world so my attitude in this regard, even if it is old fashioned, can only get me into trouble on these pages. When friends get together for dinner or drinks or whatever, they need to find the payment model that works best for them. When I was in school, I ate at the same diner every night. My room-mate and I got the same meal every night and we took turns paying. If some nights one of us ordered a little more or a little less (appetizers, drinks or whatever), it did not matter, as we knew it would wash out in the end. At the same time, I had a famously cheap friend who (despite being wealthier than any of my other friends) always found a way to avoid paying when it came time to pay a bill. After about three months of his payment avoidance, I learned that we needed to ask for separate checks or I was going to be feeding him for the rest of his life. Parents should pay for their kids until the kids can support themselves and then they should treat the meal as they would treat it among friends. I love to be able to buy things for my Dad but I know that he also likes to pay my way, too. When we golf — about 8 times per year — we alternate payment. Of course, he would like to pay every time, but at 82 years of age, he can’t beat me up the hill to the pro shop anymore. What other scenarios do you encounter when you dine out? Have you ever been “stung” by friends and forced to pay for a bill that you had not expected — or wanted — to pay? When do you expect someone else to pick up the tab and when should you pay?